Our two dimensional tabby is just the purrfect gift for the cat lover with a penchant for losing their keys. 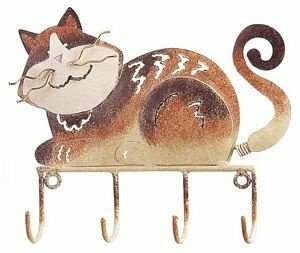 He?s the best and most beautiful part of this cat themed key rack that offers four hooks to hold spare or shared keys. Mount on a wall or closet door in any room where keys are kept or likely to be needed on the way out. A fanciful décor accent that we have a ?feline? you?ll love! Look for the matching Tabby Cat candle holder, too! Hand-painted metal. 7 x 6 inches.